← Heath Robinson Engineering Ltd. Precisely no progress on the layout since I moved house, aside from getting it set up in its own new home – a large shed with lights and power (notes on the inevitable empire-building daydreams another time) . We’ve been decorating, and entertaining guests, that’s my excuse. However last weekend my local 009 Society area group were exhibiting their layout, Evaleight, at the Newhaven MRC show in Eastbourne and I spent the Saturday helping to operate it. 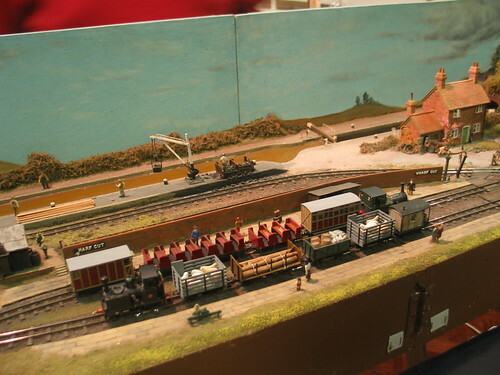 This was my first experience of operating a layout at an exhibition, actually truth be told it was my first experience of operating a serious scenic layout at all. Evaleight has been built by the Sussex Downs group over the course of the last 25 years, and can be shown in various different configurations. At Eastbourne we had the “loop”, which is three sides of scenery and a fiddle yard – still an impressive size and that’s without the two main stations attached. I spent most of the day shunting the quarry yard, each sequence of which involved receiving a train of empties from the main line then leaving the train engine in the loop headshunt while the quarry loco exchanged empty wagons for full ones two at a time. B&B couplings are used on the layouts, with magnetic uncouplers strategically placed, to allow pretty much hands-off operation save for the occasional glitch. This made it quite clear to me that I need to decide on a coupling type for Fairlight – preferably a similarly automatic one. It also showed that interesting operation is possible in a small space – even though in this case the quarry is only a component of a much larger layout you could replace the main line with a storage cassette and run the sequence more intensively. Evaleight seemed to get a lot of interest and favourable comment from the visitors to the show, and a few enquiries about future appearances, so there might be another chance to operate it before too long. 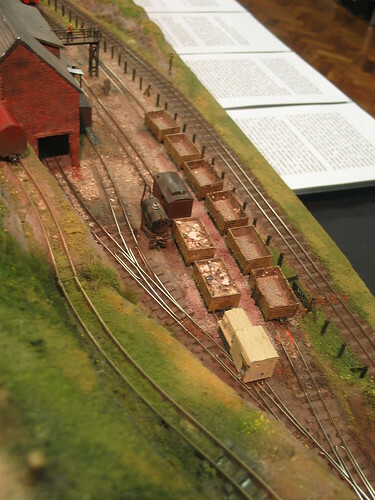 This entry was posted in 009, evaleight, exhibition, model railways, narrow gauge. Bookmark the permalink.